Located in the countryside in Umalas, Bali. Villa Umah Daun is a balinese villa in Indonesia. Located on the beach in Nusa Lembongan, Bali. Villa Voyage is a balinese villa in Indonesia. Located with sea views in Cemagi, Bali. 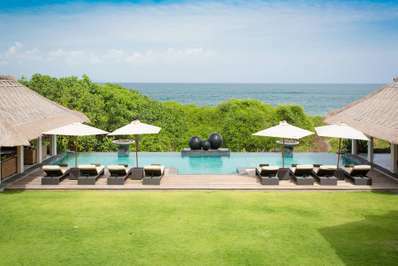 Seseh Beach Villa I is a balinese villa in Indonesia. Located in the countryside in Tabanan, Bali. Villa Iskandar is a balinese villa in Indonesia. Located near the beach in Canggu, Bali. Villa Sarasvati is a tropical villa in Indonesia. Located in the countryside in Umalas, Bali. 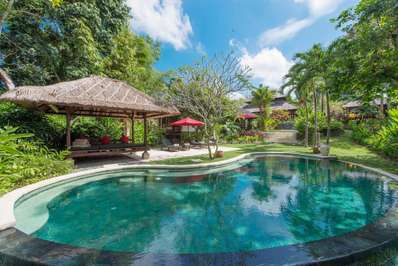 Villa Mathis 5 is a balinese villa in Indonesia. Located near the beach in Canggu, Bali. Villa Amy is a balinese villa in Indonesia. Located near the beach in Seminyak, Bali. 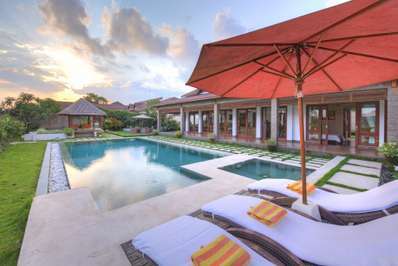 Villa Solo is a balinese villa in Indonesia. Located in the countryside in Ubud, Bali. Griya Aditi Villa is a balinese villa in Indonesia. Located near the beach in Canggu, Bali. Villa Avalon III is a balinese villa in Indonesia. Steeped in tradition and religion, the enigmatic 'Island of the Gods' offers sun, surf, and spirituality. With a tropical climate, unique spiritual culture, enigmatic beaches, verdant rice terraces, and barren volcanoscapes, Bali is one of the most well known islands in the world, and just one of over 17,000 that make up the archipelagic country of Indonesia. Having been discovered by western travellers in the 1930s, the island has since developed into the Southeast Asian nation's largest tourist destination, welcoming visitors who come to its shores seeking surf 'n turf activities. Bali has 7 sea temples to honour the gods of the sea and 9 directional temples to protect the island from evil spirits. Pura Luhur Uluwatu is the only temple that's both a sea and directional temple. Bali's main airport is named after Ngurah Rai, a national hero who fought alongside his men against the Dutch during the Indonesian War of Independence. Many Balinese are named according to birth order - if there's a 'Wayan' in the name, they're most likely the firstborn (or the 5th sibling). The oldest artefact unearthed to date on Bali is a stone pillar with an inscription that tells of a Javanese king's visit to the island in the 10th century. The archaeological find is now housed in Pura Blanjong. The Balinese use 2 different calendars, around which festivals and other religious days are based: Saka, a 12 month system that starts with a new moon and a full moon mid-month, and the Pawukon, a 210-day calendar that's believed to have roots in the agricultural history of the island. Known of "Island of the Gods", Bali is steeped in religion and tradition with an estimated 20,000 temples scattered around the island. Balinese rituals performed on the inner courtyards of shrines are exclusively for the gods, whereas performances outside the temple walls are solely for the entertainment of humans. A popular attraction for tourists is to experience the combination of music and dance that usually accompanies the temple rituals, held at least twice a year. The local celebrations and festivals are colourful and fascinating, especially the Hindu New Year of Nyepi in the spring. On the last day of the year, large sculptures of Ogoh-Ogoh monsters painted in a rainbow spectrum of colours are paraded around town and burned in the evenings to drive away evil spirits. The largest city in Bali is the provincial capital of Denpasar, followed by the old Dutch capital of Singaraja, a quiet town still alive with colonial charm. The beach resort of Kuta is a popular destination for travellers, and with its rolling waves, a mecca for surfers. Ubud, just north of Denpasar, is known as the island's cultural centre and home to an ecological reserve and temple complex. Other than being a surfers' paradise, the scenery under the waters surrounding the island offers pristine snorkeling and SCUBA diving conditions. Tulamben, with a black sand wall dive as well as a wreck dive, is a popular dive spot, as with Amed and Menjangan. Divers can expect to see hawksbill turtles, hammerhead sharks, and reef sharks in addition to the corals and smaller fish that populate the shallower reefs. Dolphins remain a common encounter on the north coast of the island. In Bali you can enjoy the black volcanic sand beaches at Jimbaran, play golf at Nusa Dua, climb a volcano and soak in a hot spring at Kintamani. The upscale bars and clubs at Seminyak offer evening pleasures, while birdwatching and trekking through the West Bali National Park, or tasting authentic treats from kaki lima - roving vendors - on Legian Beach provides a more authentic local feel. Bali continues to amaze visitors with its unique culture, beautiful nature, diverse tourist attractions and varied food. Bali, with its reputation of being deeply spiritual, is a favourite haunt with yoga and mediation practitioners alike. The island is home to many enlightening retreats and rejuvenating studios, and for visitors with less time or those who crave more privacy, private classes can be arranged at the student's villa or hotel. With its coastal beauty, lush rice terraces, and magnificent volcanoes, Bali is a bewitching island famed for its spirituality and culture. Holidaying in a villa on Bali provides a perfect base from which to explore the island's many cultural, natural, and culinary attractions. Most international visitors to Bali land in Ngurah Rai International Airport, which is well connected to other cities in South East Asia as well as Australia. Although commonly known as 'Denpasar International Airport', the island's main airport is actually located 30 minutes away from the provincial capital. A coast road circles the outer ring of the island, with 3 main arteries crossing the central mountains. Mount Batur and Mount Agung are two of the most well known active volcanoes in Bali. Mount Batur, the smaller of the two at 1,771 metres, sits in the middle of a vast ancient 10km-wide crater with a lake at the bottom. Hire a guide to point out interesting attractions along the hike, and reach the summit by dawn to enjoy a breakfast reward of eggs cooked by the sizzling heat of the smoldering volcano. Learn to ride the waves in the world's surfing mecca. Kuta Beach in southern Bali, with its long sandy beach and long rolling waves, is home to several surf schools, with lessons and class sizes catering for riders of all levels and schedules to suit your vacation length. The Rip Curl School of Surf has been established on Bali for over 10 years with three locations around the island, including Kuta. A prime destination for the spiritual traveller, Bali provides an inspiring environment to rejuvenate the body, mind, and soul, with yoga and meditation classes taught by regular and visiting yogis. The Yoga Barn in Ubud is set amidst the tranquility of nature and offers multiple drop-in classes offered daily. 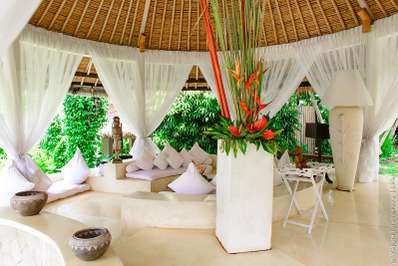 Bali Yoga Shala in Seminyak can also organise for one-on-one lessons in the privacy of your own villa. Wenara Wana, commonly known as the Sacred Monkey Forest of Padangtegal, is a spiritual sanctuary, home to long-tailed macaques and Balinese Hindu temples. The village of Padangtegal is famed for its local artisanal talents, many of who has had their painting and woodcarving masterpieces showcased in museums around Ubud. Bali boasts some 20,000 temples on the island, of which Pura Tanah Lot is the most well known with its striking location. Try Pura Luhur Uluwatu on the western end of Bukit peninsula - the clifftop setting is perfect for sunset.